Resin injection molded components around metal parts. 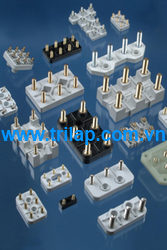 Terminal blocks, Low/medium voltage industrial insulators. Brush holder supports, tap changer parts (traction).